Its been 7 weeks now since we arrived at Camping Los Escullos nestled in the secluded and unspoiled Cabo de Gata Natural Park and it's beginning to feel quite a lot like home. With each passing day we find ourselves feeling more and more grateful to have found what, for us at least, is an ideal winter base. With a combination of the quiet setting, options for outdoor activities and a collection of friendly and like minded fellow guests to chat with, we feel able to balance our need for rest (after more than 8 months of touring), our urge to explore and the desire to interact with others as well. It just feels like we are in the right place at the right time for us. 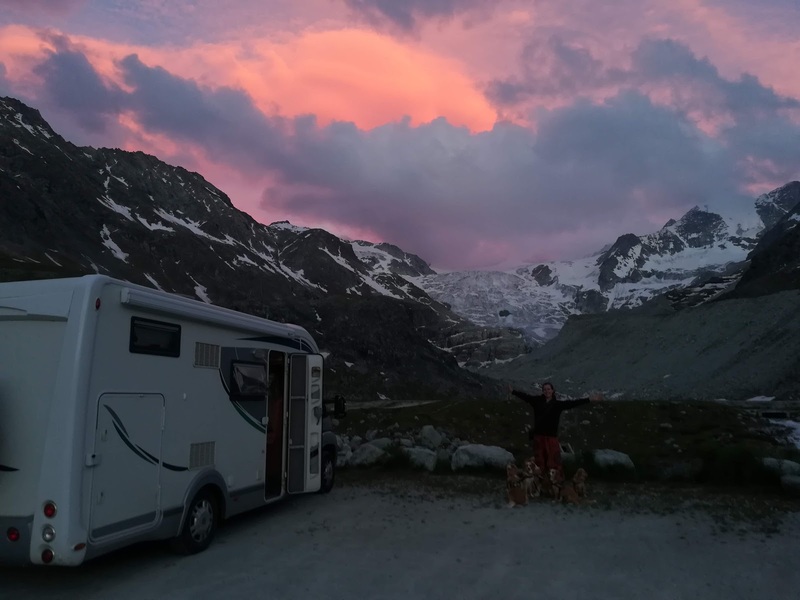 This article reflects on why we feel it is so important to occasionally take a pause from our motorhome tour, enjoy the comforts of a base and renew our energy to hit the road again refreshed. Having spent most of the summer on motorhome aires, which allowed us to visit some incredible places very cheaply, these last few weeks we have really appreciated a slightly different way of campsite life, drawing us to reflect on how much and why a campsite can add so much to our sense of happiness and wellbeing. Click here to read our best and worst bits of campsite life. On a simple level the benefits that campsites offer compared to touring (i.e. moving on every day and staying overnight on motorhome aires or car parks at night) are obvious. The practical benefits of having more spacious sanitation facilities, washing up and laundry space (albeit external to our home) are something we highly appreciate. This was especially true during some of our more fleeting campsite stays in summer and autumn when, after a period of time away from campsites, we would arrive chomping at the bit for a nice long hot shower, a handy washing machine and the ability to clean our dishes without having to be so mindful of splashing (for a day or two at least). In addition, having access to mains electricity is possibly one of the most important advantages to us; allowing us to charge up our phone, computer etc with far more ease. Plus we can relax in the knowledge that fresh water and waste emptying facilities are only ever a stroll away. Touring around not knowing where your next refill or empty can take place was a small but ever present niggle of stress during our most active and mobile days through summer and autumn (especially when we stayed for several days in the mountains where motorhome service stations were few and far between). Obviously the level of enjoyment bought about by these creature comforts varies massively from campsite to campsite, where the variation in the quality of facilities is vast. The enjoyment of taking a nice long shower is massively diminished when the water is lukewarm, the floors are in need of a good scrub and the block is open to the chilly evening air. Despite whatever the photos imply or the campsite description says, until you pitch up we've found you really can't count on the quality of the campsite. Even personal reviews and recommendations from others can be a bit flaky since everyone has different standards, expectations and desires. For instance, before we arrived at Los Escullos, some people we had told we were coming here explicitly said "Why? There's nothing there; no bars, restuarants or anything" but for us the quiet, remote, natural setting is exactly what we wanted. Not a bad setting for some temporary roots over winter! There are, of course, downsides to campsite life as well. They cost us money, we may not like our neighbours and the weather may turn worse. But there are long stay deals in the offseason, so far we have gotten on well with everyone we met and, frankly, we can always move on whenever we like anyway. For us any other small inconveniences is more than offset by the fine weather and spectacular setting we have found ourselves in. There is also a key difference between our more fleeting visits and our current situation of staying put for some weeks in terms of both mindset and lifestyle that affects how much we get out of campsite life. Whilst on our short summer and autumn visits to campsites we certainly appreciated the access to some more conventional facilities (as well as 'treat facilities' such as swimming pools and spas), it is perhaps not true to say we enjoyed them or perhaps relaxed into them. After all, it was still fine weather in the mountains and in our minds that meant peaks to climb and cols to cycle up. Stopping a while to recharge both ourselves and our motorhome may have felt necessary, but we also wanted to hit the road again soon and had a list of 'chores' to tick off. Sometimes we actually felt busier during those 'static' days than we did on activity days. This winter, in contrast, we know we have access to those facilities for the weeks ahead. They are not time limited in the same way and that relaxation brings a much deeper enjoyment to us. But, going beyond the handful of creature comforts that a campsite can offer, in recent days we have come to realise that our decision to remain on a campsite longer through winter is bringing us happiness in a much deeper way than by offering a few practical advantages. The old adage "a change is as good as a rest" is true in many situations, including motorhome touring it seems. Before we set off some acquaintances who had traveled extensively had told us that everyone who travels, in the end feels a need to put down some roots again for at least a while, whether that be after 3 months or 3 years. We were far too exhilarated by the thrill of the open road in summer to think that this might be the case on our tour. But as winter has compelled us to move further and further south in search of sun and our options for outdoor adventures in the high Alps and Pyrenees disappeared we did start to feel a pull to rest up a while and take stock of how much had changed in the past months. Putting down our own roots for a while, albeit just a matter of weeks, has unexpectedly contributed to a deep sense of calm and restfulness that we hadn't even realised before that we had needed. It is as though we are satisfying that urge to 'settle' without having to give up our adventure at all and it is our hope that by the time we leave our temporary winter base and begin touring once again, that we will be just as refreshed and ready to adventure as we were when we first hit the road last May! This sense of calm and restfulness has given us lots of space to think as well. We've felt inspired to start learning again, completing an online course. We've also hosted a family visit and found time to enjoy more social interactions with our fellow guests. We've even found ourselves enjoying the company of our new friend Felix, the campsite as well as the simplicity of an evening game of scrabble. Although we have met many people during our touring months who eschew campsites entirely, implying that they are somehow the expensive and easy option and not as exciting compared to the touring life, our experience is starting to show the opposite may be partially true for us. The ability for us to recharge and put down some temporary roots for the last few weeks may in fact be an important factor in making our tour even more enjoyable overall. As our time at Camping Los Escullos comes to a close we feel, in the past few days, that we've started to look forward to our touring life once more, with an excitement and vigour that we'd maybe lost sight of the start of winter. In a little under 2 weeks we'll be packing up our handful of possessions once more, moving back into "Homer" and hitting the road. We don't know where we'll be heading to first, but that doesn't really matter. We are definitely looking forward to finding out.